In in this section, we’re going to look at the midweek reversal and also the trend continuation. What this refers to is in our last lesson you learnt that after three levels of rising or three levels or fall smart money will tend to do one of two things. They will either reverse the prior trend after a stock hunt out of level 3, or they will continue the previous trend. So the reversal of 3 levels of rising or fall we call the midweek reversal and if they choose to keep the prior trend, we refer to this as a trend continuation, and we’re going to take a look at an example of both of these processes. The midweek reversal can happen on any day of the trading week and is a reversal of the dominant weekly trend after three levels of rise or fall. Now for example, once smart money has completed a weekly bull trend over the course of say two to three days; the midweek reversal we changed the direction to a better trend. We’ve seen three levels of rise, we go into level 3 accumulation, and then the market reverses, and we see three levels of fall and that is simply a reversal of the prior trend. Now the reversal is not guaranteed and is dependent on smart money’s fundamental outlook of the particular currency. Like with retail traders obviously smart money is going to be analysed in particular currency pairs at any one moment in time and they’re going to have their opinion as to whether the pair is going to be bullish or bearish over the short term. If we see three levels of rise and the fundamental outlook on the currency pair is bearish then out of level 3 accumulation smart money are going to accumulate sell orders. We’re going to see the manipulation of the retail orders to the upside inducing traders into the wrong side in a market. Smart money will sell into this, and we will see the midweek reversal as a bear trend unfolds. On the flip side if we see three levels of fall and the fundamental outlook on the currency pair is bullish, then during the level 3 accumulation smart money are going to accumulate by orders induce sellers into the market buy into this pressure and then the midweek reversal will unfold in the form of a bull trend. So the fundamental outlook on a currency pair will determine whether we’re going to see the midweek reversal or if we’re going to see the continuation of the prior trend. 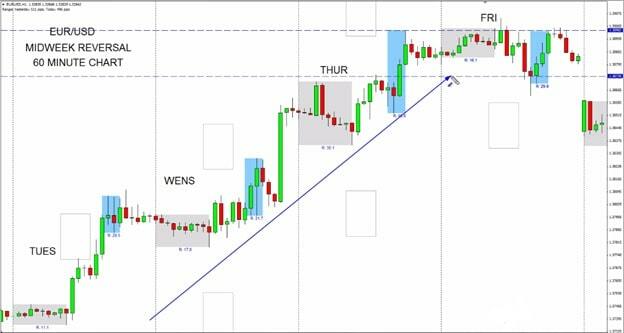 Now the midweek reversal offers a swing trade opportunity if the start of the midweek reversal can be identified and entered an intraday trade blast in two to three days can be entered with a potential of 150 to 300 Pip gain. All this means is, if we can identify the midweek reversal and we looked at an example of this in terms of catching Phase 1 of a trend sell out of the level 3 accumulation, we’re going to identify manipulation to both sides of the market and our intention is to catch the midweek reversal or the trend continuation from phase 1. If we identify that smart money going in to manipulate the market from a bull to a bear market, our job will be to recognize this manipulation during level 3 accumulation and catch the midweek reversal of the trend as it begins, and this will allow us to enter into an intraday trade for any new cycle of two to three days. Now, if you think about we process that takes place during the intraday cycle where we see accumulation, manipulation we see three levels of rise or fall, and then we see the New York reversal. This is no different to what is taking place in regards to the midweek reversal, but we’ve seen it during the weekly cycle. The midweek reversal in a sense can be seen as the weekly cycles New York reversal. They are different, but the process regarding the structure is the same during the intraday cycle. We see three levels of rise or fall during the London session, and then we see a reversal of the trend during the New York session. 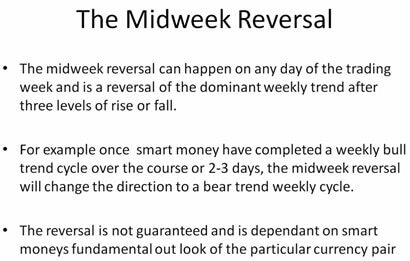 During the weekly cycle, we see three levels of rise or fall over a course or two to three days, and then we’re going to look for the midweek reversal which is a reversal of the prior trend. We’re going to take a look at an example of the midweek reversal. Okay so in this first example we’re looking at the Euro-Dollar on the 60-minute chart. During the weekly cycle, we have three moves to the upside. On Tuesday we have our phase one on Wednesday, we have our second phase, and then on Thursday we have our third and final stage, and we now know that after three levels of rise or fall we’re going to be expecting the market to go into accumulation. 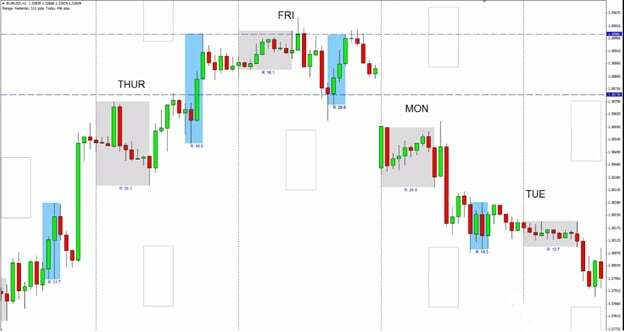 On Friday we can see that we have the sideways price action which is a characteristic of accumulation. During this process, smart money will be analyzing the Euro-Dollar currency pair and depending on the fundamental outlook of the currency they’re either going to reverse the bull trend, and we’re going to go into a new bear or downtrend, or they’re going to continue the uptrend. So if the fundamental outlook on the Euro-Dollar is positive then during the accumulation period, they’re going to accumulate in buy orders. On the flip side, if the analysts at the institutions come back in, they have surmised that the Euro-Dollar is looking bearish and the fundamental outlook is to the downside than during the accumulation period. They’re going to be accumulating sell orders, so the midweek reversal is going to be a move opposite to the prior trend. So, in this case, we have a clear uptrend. So if the fundamental outlook on the currency pair is to the downside, we’re going to expect to see our midweek reverse, when again the midweek reversal can occur, on any day of the week. We have Tuesday Wednesday Thursday which are three levels of rising Friday are the accumulation, and then on Monday and Tuesday, we can see the reversal of the trend. Okay, so smart money regarding their fundamental outlook for the Euro-Dollar would have been bearish. So during the accumulation period, they would have accumulated sell orders. Now there is a clue regarding what their fundamental outlook will be, and we get this regarding the stock runs. We know that during level 3 accumulation it’s impossible to tell what smart money are accumulating but during the accumulation period we can see that most of the activity occurs in the resistance area. We have multiple pins and breaks of the resistance. Now we know that this will induce retail traders into the buy side of the market so just by recognising that fact we can change our bias as to what the next move of the trend will be. If we see that they’re inducing buy orders into the market, we can surmise that there’s a high probability that the next trend of occurring is not going to be a continuation of the prior but a midweek reversal to the downside and as these buyers come in their orders are absorbed, and then we can see that we have 3 levels or drop to the downside. Now as we know if we can catch phase 1 out of the accumulation zone we will be able to trade an intraday position for a 3-day cycle. So the midweek reversal can occur on any day of the week and will be seen after three levels of rising or fall. What determines if we’re going to see the immediate reversal is the fundamental outlook on the currency pair. please what do you mean by “fundamental outlook on the currency pair”?